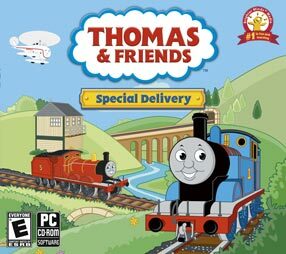 "Thomas & Friends Special Delivery"
Join Thomas & Friends on a brand new adventure across the Island of Sodor as they try to deliver some very special cargo. James is asked to make an important delivery to the zoo, but he gets lost along the way. Sir Topham Hatt sends a search party to look for him. Can you help Thomas and Harold find James and get him and the animals to the zoo on time? Dance to the music and match the pairs. Be sure to seat your party pals in the right chairs. Splash, splop! Bubbles float on top. Click on colors, shapes and numbers to make them pop. Grandpa loves to tell stories that rhyme. Choose the right word to finish each line.